For "Mad Men" fans only: maybe you could call it creativizing history? The opening scene of the first episode this season, (the Young & Rubicam water bombs thrown on Madison Avenue protestors) was not fiction. It came verbatim, including the dialogue, from a May 28, 1966 New York Times front page story. Read more about For "Mad Men" fans only: maybe you could call it creativizing history? I've commented in the past that as a personality, Mitt reminded me a lot of the Arrow Shirt Guy of advertising days of yore. Who was just a cypher of all-American clean-cut tall healthy white maleness and quiet strength. Read more about Mitt's image morphing? in "The 36th President," published in The Guardian. Alastair Cooke was The Guardian's "America correspondent" at the time of the assassination. It's amazing to me how much he knew and understood about LBJ's politics at the time, and how he could express it in such a short piece. The following, the second part of a two-part series, is excerpted from a talk originally given by Saul Bellow in 1988 and now published here for the first time. A footnote has been added by the editors. New York Review of Books for the November 10, 2011 issue. Update 11:24am: readers nevermind: he fixed it; see his comment below. The horrors of the story out of Philadelphia, of the gang who imprisoned and tortured developmentally disabled people in dungeons in order to collect their SSI checks, just keep coming and coming. It could encompass as many as 50 victims over 5 states, and past deaths. 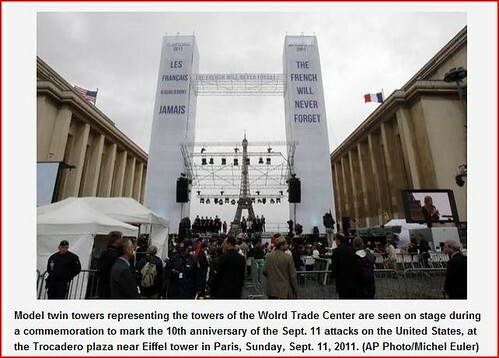 A few pictures to remind myself and others that might tend Amerocentric that 9/11 is not just an American memory. One of the specific targets was the World Trade Center. Not to mention that civilian aviation worldwide would never be the same.